Sail: How did the idea come to you? Saud AlNowais: I was constantly brainstorming with my friends for a startup idea. One day I told my friends: “How about we crowd-source soccer players to recruiters?”They said: It’s a nice idea, but it’s too big. The moment I heard “too big”, I felt I had to do it. If it’s too big, it means no one has done it before. We wanted it look like LinkedIn or Facebook but specifically for soccer. Sail: What’s the problem that you are trying to answer with GoldCleats? Saud AlNowais: Everything on GoldCleats is a result of a problem we are trying to solve. There are over half a billion soccer players today in the world and all these soccer players believe in themselves and want to become professionals. Many of them have the talent but unfortunately luck plays a role. Very often we hear “This guy is better than the other guy but the other made it and this guy didn’t.” So GoldCleats is trying to maximize the opportunity or probability for someone to play professional soccer somewhere in the world. We do this by helping him market himself, and the best way of marketing oneself today is through phone apps, social media, internet, etc. Sail: So how does a player market himself using GoldCleats? Saud AlNowais: Soccer players upload their content: their profile, the positions and the teams they’ve played in, and they can upload videos of their skills. It’s like a soccer résumé. Videos are important because recruiters, coaches, scouts, and agents can see them to validate how good the player is. The more content the player creates the more a coach or a recruiter can see how good he is. We’re trying to get you recruited. We give you the platform and it’s your job to upload the content. Sail: What’s the role of coaches on GoldCleats? Saud AlNowais: We try to solve the problem of unemployed certified coaches around the world. So we get them on board as “GoldCleats Coaches”. Their job is to constantly be on the platform to give the players instant feedback, to tell the players how to improve, and to evaluate the players through our online evaluations. Sail: How does a coach evaluate me as a player online? Saud AlNowais: You can take the evaluation online, and then a coach will evaluate you based on a video that he asks you to upload. He can ask you for specific skills and your job as a player is to demonstrate those skills in a video of your own, upload it to GoldCleats, and our coach will then take between 2 to 4 days to evaluate you. He will give you a report card, which you can make public to all recruiters. Sail: What do you aim to achieve with this evaluation? Saud AlNowais: If you go to college today you have to take the SAT or TOEFL, but what do you take if you want to play for a soccer club? GoldCleats wants to provide the standardized test for that. We are also trying to create analytics and statistics around the industry. We want to be the go-to website for anything related to soccer. Sail: Where did GoldCleats reach so far? Saud AlNowais: We have launched our Beta version and we are about to open it up to public in the next few months, hopefully by the beginning of the year 2015. The player accounts are ready; we actually have some players on our platform uploading their content already. We invited 10,000 players of which 4,500 players are now active. We’re about to sign our first MOU with the United Sates Coaches Association – they have 34,000 coaches and we want to be the platform for these coaches to communicate with players. We’re also in the MOU discussion phase with the US Coaching Curriculum and we want to promote it on GoldCleats for players who are looking to develop online. We are also starting another MOU with our first soccer association. Sail: Why the name GoldCleats? 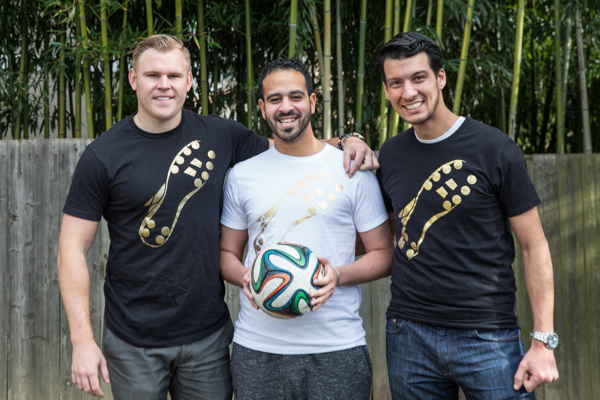 Saud AlNowais: We chose GoldCleats as our name because Gold is the most valuable color, cleats is what you wear when you play soccer. We wanted to say the most valuable player, and usually the most valuable player always wears those golden cleats. FIFA has something called the Golden Boot award, but we took it a step further and said GoldCleats. Sail: I’ve noticed as well from the website of GoldCleats that you are involved in tournaments? Saud AlNowais: Yes, we’re hosting our first tournament in Egypt. We’re also hosting another tournament in the US. There are a lot of soccer tournaments all over the world, and we’re hoping to reach the tournament organizers. If you’re a tournament organizer and you want to be unique, come to GoldCleats, we have the solution for you. Sail: What would you provide for the tournament organizers that is different? Saud AlNowais: I’m a soccer player, I go play in a soccer tournament. At the end of the soccer tournament I get a cup and medal, and that’s it. But GoldCleats tournaments are different. You get a cup and a medal, you get an account on GoldCleats, and you get all the footage on GoldCleats. We are willing to partner with tournament organizers to stream the entire tournament onto our platform. So why not make it memorable for the players who’re playing in your tournament by partnering with GoldCleats? Sail: Where do you see GoldCleats from here? Saud AlNowais: We’re focused on the US, Egypt, the UK, and we want to be in every country. Any country that has a significant soccer population, we want to be there. We want to make sure that the next star in the soccer world 10 or 15 years down the line, comes from GoldCleats. We want to help these kids realize their dreams. We want to make sure that agents can be verified. We want to make sure that the recruitment process is clean. We want to make sure that we can eliminate any bias that we see today in the current system, which in my opinion is corrupt and inefficient. That’s why we are trying to provide an alternative to the current system, and make GoldCleats the actual system. Sail: With all of this experience, what have you learned the most? Saud AlNowais: Patience. I’m someone who suffered from an anger problem. I think my experience in the past ten years has really taught me how to be patient. I realized wasting my energy to be angry is not going to do me any good. Sail: What’s your favorite quote that you’d like to share with our readers? Saud AlNowais: In our GoldCleats office we have a quote on our door. It says: “Great ideas without implementation are hallucinations.” You have a great idea, so what? I am not interested in hearing about your idea, I am interested in seeing you do it. A lot of the startups that got sold for billions of dollars aren’t really creative but it was a great idea and someone took the time to implement it properly.